Pharmacology is the fulcrum upon which clinical practice revolves and it builds on foundations laid down by physiology, biochemistry, genetics, pathology, and cell biology. Rational drugs prescription is an integral skill that must be acquired by every medical doctor. In many medical schools, medical students have limited exposure to pharmacology and upon graduation they tend to rely mainly on information dished out by pharmaceutical companies for sales promotion. This attitude provided fertile ground for new medical graduates' poor abilities to recognize and manage intricate medication or treatments, and ultimately, they cannot ensure sound rational drug use. Consequently, polypharmacy, drug–drug interactions, and adverse drug reactions ensue. Pharmacology, though both basic and clinical, is central to therapeutic success. Rational therapeutic decisions can only be taken with sound knowledge of pharmacology. Most students at undergraduate level consider it as complex, impulsive, and parched. Students often have to put in great effort when it comes to understanding pharmacology as a course. This is because it requires, among other things, sound-integrated chemical, physiological, and precise thinking. Equally important is the basic teaching skills among lecturers who taught pharmacology in undergraduate medical colleges. Most of these lecturers are trained medical doctors who double also as researchers and clinicians. Despite their expertise on the subject of pharmacology and research, they most often than not are lacking in basic teaching skills. A significant number of drug poisonings cases were due to use of prescribed drugs; this occurs because of a poor grasp of pharmacological knowledge among prescribers of drugs. There is a dearth of clinical pharmacologists even in developed climes, who are supposed to train health professionals to avert dangers associated with bad prescription habits. The American College of Clinical Pharmacologists opines that there is a pressing call to develop on the clinical pharmacology education in undergraduate physicians. Medical graduates, as team leaders of health-care delivery, must have a sound knowledge of pharmacology for them to prescribe safely and effectively. Studies have shown that about 7–10% of prescriptions emanating from newly graduated doctors contain errors. This is more so with a high turnover of new drugs with complex pharmacokinetic and pharmacodynamic profiles, evolving genetic and epigenetic variables that influence drugs characteristics in the body. Coupled with this is the need to avoid adverse drug reactions due to prescription errors which now constitute formidable challenges to effective health-care delivery even in best of centers, hence the emergence of personalized medicine. Rational prescription also promotes cost-effectiveness in health-care systems. The aim of this study therefore was to assess the perception of medical students of Usmanu Danfodiyo University, Sokoto, on pharmacology and obtain a feedback upon which further study can be built, to improve the teaching and learning of pharmacology in the study area. It was a descriptive cross-sectional survey, involving all final and semi-final year medical students of College of Health Sciences, Usmanu Danfodiyo University, Sokoto, Nigeria. Pharmacology is offered as a course in UG III and UG IV in the Department of Pharmacology and Therapeutics. The period of its teaching spanned over a period of four semesters after which students sit for the second MBBS professional examination. All the lecturers were qualified medical doctors at various levels of academic cadres from professors to lecturer II. A total of 167 volunteers were recruited by multistage sampling technique in the study and participation was entirely voluntary. Each participant signed informed consent form before commencement of the study. Stage I: total number of medical students was obtained from the administrative office of the college. Stage II: number of clinical year students was extracted from the overall number of medical students. Stage III (criterion sampling): only students who wrote and passed pharmacology and were in the next levels (500 and 600 levels) where pharmacology was not offered were eligible for participation to avoid bias. The questionnaire was designed from validated questionnaires of previous studies ,, that assessed attitudes and perception of final medical students on pharmacology with slight adaptation to reflect our local needs. The questionnaire was validated for test and retest reliability through a pilot survey on clinical year medical students of University of Benin before start of the study. It comprised three sections; Section A for demographic profiles of respondents, Section B on the perception of pharmacology, and Section C for open-ended questions. It was designed on 4-point Likert scale to evoke forced choice. The administered questionnaires were distributed and retrieved by coresearcher (ARZ) on the spot of administration. Those that could not fill the questionnaire were given until the following day for collection. The data generated were analyzed with SPSS Statistics version 20 for crude descriptive statistics, proportions, percentile scores, odds, and 95% confidence intervals. Percentile scores for each item of the perception assessed. On 4-point Likert scale, strongly agreed was scored 4, agreed 3, disagreed 2, and strongly disagreed 1. We further calculated proportions, odds, and confidence intervals for each item. For open-ended questions and demographic profiles, we employed descriptive statistics. After data mining and cleaning, a total of 155 questionnaires were analyzed, a response rate of 93%. Majority of the respondents were males 105 (67.7%), within the age bracket of 18–25 years (66.5%) and single 139 (89.7%). None of the respondents strongly agreed to pursue pharmacology as career at post graduate level. Only 35 (22.6%) wished to take pharmacology as a specialty. Majority preferred reading textbooks (69, 38.1%) as source of reference. Chemotherapy, cardiovascular, and central nervous systems (CNS) were considered the most important topics in clinical practice 142 (91.6%). Autonomic nervous systems (ANS) and CNS were cited as most difficult 152 (98.1%). Audiovisual-aided teaching method was the most favored by the respondents 109 (70.3). 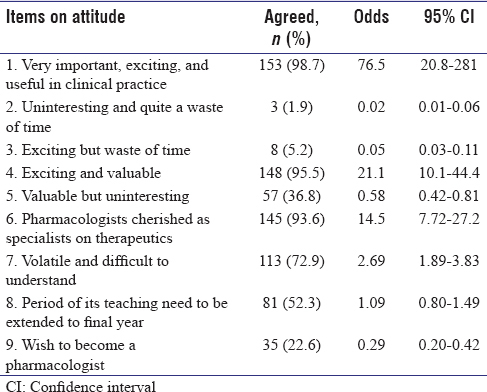 Percentile scores of participants on attitude towards Pharmacology has been shown in [Table 1]. Majority of the participants in this study were males, a finding that sharply contrasted observations in similar studies in India and Malaysia., This may not be unrelated to gender inequality against girl- child education in northern Nigeria, specifically where the study was carried out and Nigeria in general. Various governments in the past have tried to minimize the gap but efforts remained much to be desired due to cultural, economic, and religious among other factors., This study revealed very low interest of respondents to pursue pharmacology as a career at postgraduate level [Table 2]. The finding was consistent with observation made in India in which only 10.9% of students interviewed considered pharmacology as a career at postgraduate level. This was really disturbing taking into cognizance the dearth of clinical pharmacologists not only in Nigeria but globally and their increasing roles in successful health-care delivery and research. This is more so with emergence of personalized medicine with clinical pharmacologists playing very critical role. The opinion expressed by majority of participants in this survey that pharmacology was difficult and volatile was comparable to the findings in a similar study [Table 2]. This may be due to unsuitable teaching technique as in most cases the lecturers in the medical colleges do not possess basic teacher training education despite their expertise in research and in what they lecture., This may be the reason for poor response from students when asked if they wanted to specialize as pharmacologists at postgraduate level despite enthusiasm in the subject. It serves as a wakeup call to lecturers to review teaching methods to stem the tide of this ugly perception and this can effectively be done by acquiring basic teacher education. It is however gratifying that virtually all students regarded pharmacology as exciting and very important in clinical practice and only a few felt that studying of pharmacology was a waste of time [Table 3]. 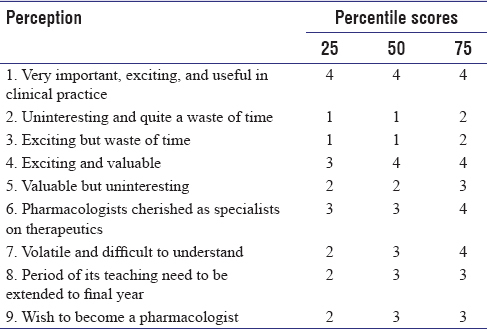 This observation reechoes the findings in sister survey in which 62% of the participants interviewed regarded pharmacology above all other subjects in medical school in terms of importance. This is reassuring and with suitable teaching methods the general apathy of medical students toward pharmacology can be reversed. Establishing distinct health education departments across colleges of medicines will go a long way in strengthening teacher education among the lectures that play triple roles of clinicians, teachers, and researchers. Feedback from students is critical in modification and reviewing teaching methodologies to meet ever dynamic realities of evolving field of science like pharmacology., Reinforcing learning model with discussion has been proposed as one of the best method of teaching pharmacology among undergraduate students. The need to evolve teaching method that appeals to students so as to encourage them to take up postgraduate training to meet current challenges of dearth of clinical pharmacologists cannot be over emphasized. In this study, audiovisual-aided method of teaching was reported to be the most favored among participants. This observation agrees though lower than 92.7% findings reported in a similar study in Lagos. This finding may be useful especially in teaching such topics as ANS and CNS that were reported to be more difficult and conceptual in this survey and similar reports. In conclusion, this study has shown that despite demonstrated interest, there was negative attitude toward pharmacology among the respondents and further painted a gloomy picture of addressing shortage of clinical pharmacologists. It is possible that appropriate teaching techniques acquired through teacher education by lecturers may help in curbing this negative attitude. The study was merely descriptive; however, its findings can provide basis upon which targeted intervention can be mounted. Boreham NC, Mawer GE, Foster RW. Medical students' errors in pharmacotherapeutics. Med Educ 2000;34:188-93. Bhosale UA, Yegnanarayan R, Yadav GE. 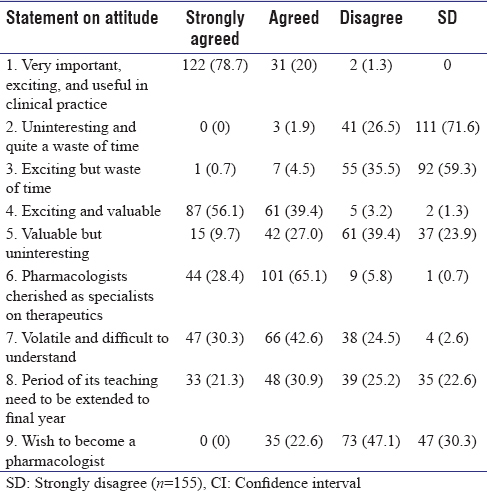 Attitude, perception and feedback of second year medical students on teaching-learning methodology and evaluation methods in pharmacology: A questionnaire-based study. Niger Med J 2013;54:33-9. Jalgaonkar SV, Sarkate PV, Tripathi RK. Student's perception about small group teaching role play method and case based learning in pharmacology. Educ Med J 2012;4:13-8. Duconge J. Applying organ clearance concepts in a clinical setting. Am J Pharm Educ 2008;72:121. Lowry S. Teaching the teachers. BMJ 1993;306:127-30. British Pharmacological Society. Prescription for the NHS. Available from: http://www.bps.ac.uk/view/index.html. [Last accessed on 2018 May 07;17:15]. Wiernik PH, Public Policy Committee of the American College of Clinical Pharmacology. A dangerous lack of pharmacology education in medical and nursing schools: A policy statement from the American college of clinical pharmacology. J Clin Pharmacol 2015;55:953-4. Ross S, Maxwell S. Prescribing and the core curriculum for tomorrow's doctors: BPS curriculum in clinical pharmacology and prescribing for medical students. Br J Clin Pharmacol 2012;74:644-61. Prasad SR, Ravi H, Santhosh R. A questionnaire based study on student's opinion on the teaching and learning methods in pharmacology in a medical school in India. Int J Basic Clin Pharmacol 2016;5:2589. Oshikoya KA, Bello JA, Ayorinde EO. Medical students' view on the methods of teaching pharmacology at the Lagos state University College of Medicine, Nigeria. Nig Q J Hosp Med 2007;17:101-7. Majunath SM, Nagash RG, Srinivas TR, Somerwara GM. A study on evaluation of medical student's perception and feedback of teaching-learning of Pharmacology in Medical College. Int Arch Integr Med 2015;2:102-10. Mahfoudh AM, Abdulghani, Redhwan AA. Students' perception about learning pharmacology at a single private institute in Malaysia. J Taibah Univ Med Sci 2015;10:40-4. Grace N, Solomon A, Olugbenga O, Vehcit D, Binta A, Mairo M. Girl child education: Rising to the challenge African. J Reprod Health Sept 2010;14:107. Okorie M. An assessment of factors militating against girl child education in Nigeria. Int J Adv Multidiscip Soc Sci 2017;3:49-54. Rawlins MD. Clinical pharmacology in health care, teaching and research. Br J Clin Pharmacol 2013;75:1219-20. Standing Committee on Postgraduate Medical and Dental Education Creating a better learning environment in hospitals 2: Making the most of formal educational opportunities for doctors and dentists in training. London: Department of Health; 1994. Victoroff KZ, Hogan S. Students' perceptions of effective learning experiences in dental school: A qualitative study using a critical incident technique. J Dent Educ 2006;70:124-32. Varsha JP, Supriya DM, Devang AR. Students' perception on feedback module in pharmacology. J Health Educ Promot 2016;5:17. Sarkate P, Jalgaonkar S, Tripathi R. Perception of medical students towards teaching of pharmacology through reinforcing learning model. Natl J Integr Res Med 2015;6:101-4.